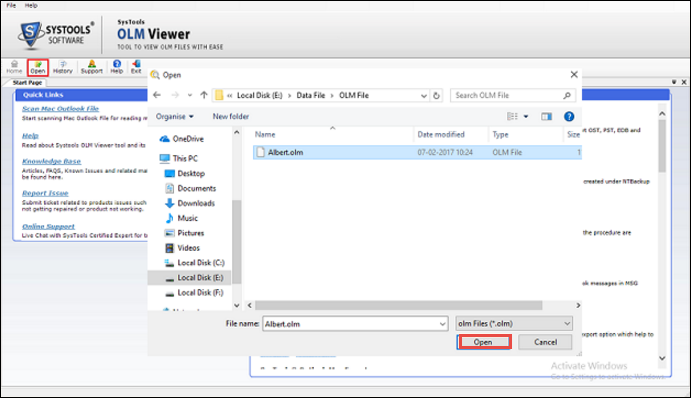 OLM file viewer is designed to provide an easier platform to open the .olm file and view it, regardless of the supportive environment. 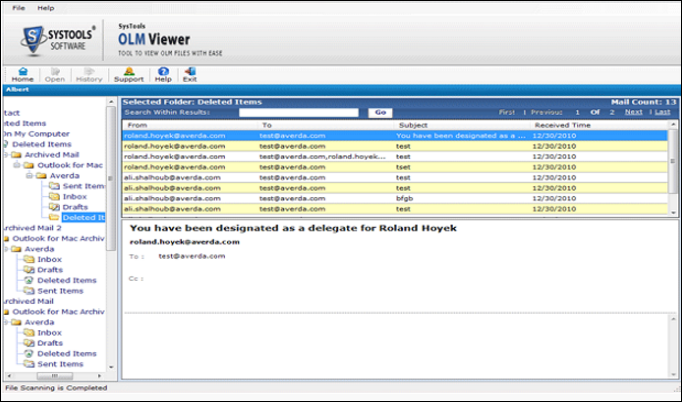 Also, the user can view .olm files like contacts, tasks, and email messages along with its attachments. Also, this tool can easily view the large OLM files without any issues. The software also can perform a quick scanning of OLM file in order to display all the data items. Also, the OLM reader helps to load all the folders such as Inbox, Sent Items, etc and easily able to view the corrupt or inaccessible .olm files. The free OLM file Reader generates a preview of the scanned OLM file and will retain the complete details of each item. It allows the user to view .olm file contents such as email attachments, calendars, meeting, appointments, etc without any data loss. Freeware OLM viewer does not require any kind of supportive application for its working. After loading the entire content of OLM file, now user can read OLM files independently. 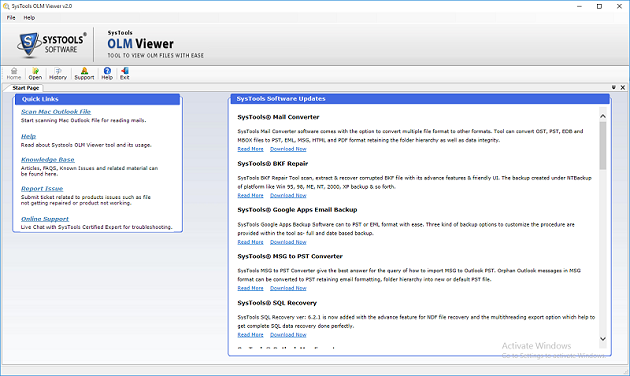 The application also having simple GUI and can be accessed by any computer users. Once the scanning has been finished, software will prompt a user to save the scanned OLM database file. However, user can save it on the local machine. Later, if users want to open the same .olm file again, then, they can open the saved file and preview its data also. This freeware utility offers an interactive interface so that users can easily open and view OLM files within few easy steps. 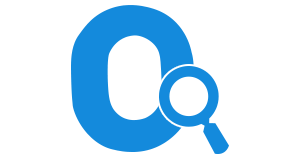 Even a novice user, who can also read the complete content of an OLM file without any requirement of a technical expert for using it. Does the OLM reader allow to view .olm file with attachment? Yes, the tool can scan the OLM file completely and then, preview the scanned .olm file without any issue. I am using Mac OS on my desktop and wants to view the OLM file within it. Is your tool compatible with this Mac machine? No, OLM file reader is only compatible with Windows OS 10, 8.1, 8, and all below editions. 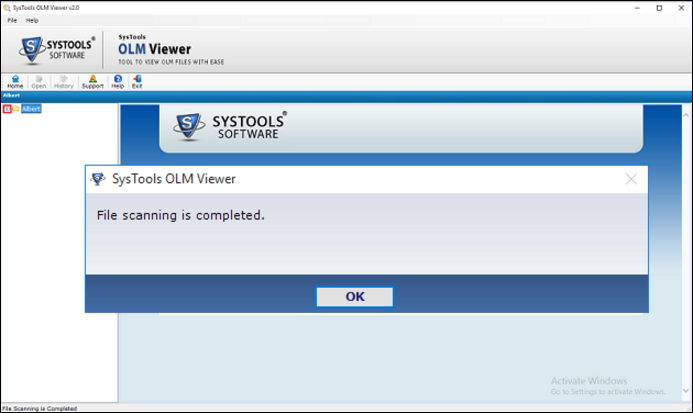 Does the tool require an installation of any external application for reading the OLM data items? No, the OLM file viewer is totally an independent utility and does not need any sort of virtual environment for its working. Can I easily view the corrupted or inaccessible OLM file using the OLM viewer tool? Yes, OLM reader software provides complete support for the orphaned or corrupted OLM files. The user can also open the file and view all the inaccessible .olm files efficiently. Is it possible to view a large number of OLM files using the OLM Reader tool? Yes, the OLM file opener allows to scan and open any sized .olm file. So, user can easily view contents of .olm files without any data loss. First, Download & Install the Free OLM File Reader on the local machine. "My OLM files got corrupted and I have no hope to recover and view my lost data from it. Thankfully, I got to know about OLM file opener to open corrupted and inaccessible OLM files for free. The tool effectively scanned my corrupted OLM file and permit me to view all the contents without any data loss." "One of the considerable feature offered by OLM Reader is to view any size of OLM file. It helped me to scan complete details associated with each data items. Thus, I can easily scan and load the data without any file size restriction. My heartiest thanks to the software development team for making such an awesome product for the users."